Mrs Frecklington presented certificates to Errol Young and Nelson Dimond and thanked them for their dedication to their volunteer roles. 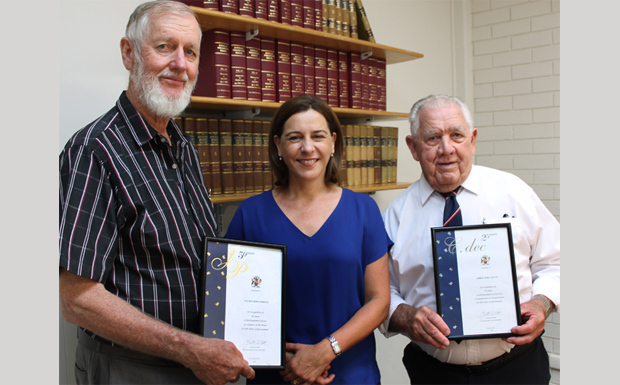 “It is so important that we recognise local Justices of the Peace who dedicate so much of their time to supporting members of the community when they need help with documents, at often very important moments of their life,” Mrs Frecklington said. “When you add up the years of service these two gentlemen have provided, you can see how important their role is in regional areas like this. “It’s obvious they have built a level of trust in the community and people rely on them for guidance and assistance when they need it.